John A. Widtsoe-Scientist, Educator, and LDS Apostle was one of the worlds brightest minds. He pioneered dry farming techniques used around the world, enabling farmers to grow needed produce in harsher climates. This maquette was the winning concept for a large statue commissioned in 2016 and placed at John’s birth place of Froya, Norway in 2017. 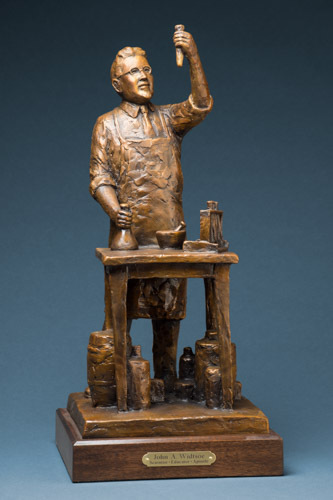 This smaller model is a more recognizable image to those who knew Dr. Widtsoe, unlike the final larger statue which is a much younger John in an attempt to inspire youth on Froya, the birthplace of John and a small island in Norway, that they can reach beyond that small island as John did to go on and attend Harvard and graduate with honors. He went on to be the President of both Utah State University and the University of Utah. He was also a professor of agriculture at Brigham Young University. During his time as an apostle for the Church of Jesus Christ of Latter Day Saints, Widtsoe also taught a religion class at the University of Southern California.